Scientists understand that Earth's magnetic field has flipped its polarity many times over the millennia. In other words, if you were alive about 800,000 years ago, and facing what we call north with a magnetic compass in your hand, the needle would point to 'south.' This is because a magnetic compass is calibrated based on Earth's poles. The N-S markings of a compass would be 180 degrees wrong if the polarity of today's magnetic field were reversed. Many doomsday theorists have tried to take this natural geological occurrence and suggest it could lead to Earth's destruction. But would there be any dramatic effects? Reversals are the rule, not the exception. Earth has settled in the last 20 million years into a pattern of a pole reversal about every 200,000 to 300,000 years, although it has been more than twice that long since the last reversal. A reversal happens over hundreds or thousands of years, and it is not exactly a clean back flip. 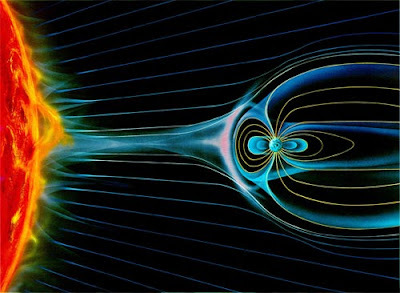 Magnetic fields morph and push and pull at one another, with multiple poles emerging at odd latitudes throughout the process. Scientists estimate reversals have happened at least hundreds of times over the past three billion years. And while reversals have happened more frequently in "recent" years, when dinosaurs walked Earth a reversal was more likely to happen only about every one million years.